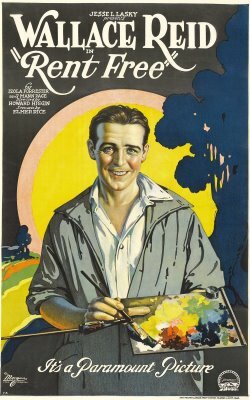 1921-1922 - The Films of Wallace Reid silent era films of Wallace Reid. 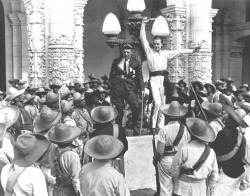 Reid as Buell Arnister jr.
Wallace Reid stars with Gloria Swanson, Bebe Daniels and Wanda Hawley. Ms.Swanson is perhaps, the only person who worked with Wally who had something negative to say about him. She said she knew of his drug addiction and was terrified of him. She insinuated that Wally was enamored of her and was acting weird-foever offering rides (which she refused). One day she said that his valet came to her dressing room and asked for a picture of her ,as per Wally 's instructions. But, then, even in her autobiographical book, "Swanson on Swanson", there was nothing there to indicate that Wally was ever rude to her or acted out of line. 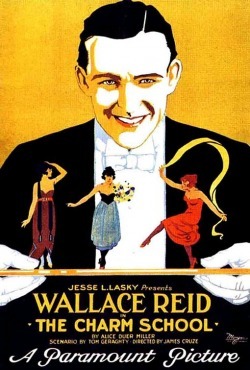 Wally plays a scene here with Bebe Daniels in "The Affairs of Anatol" . Wally and Gloria Swanson are lovey-dovey in this romantic scene "The Affairs of Anatol". Outside the set, Ms.Swanson claims to be terrified of Wally (and she's the only one who was!). 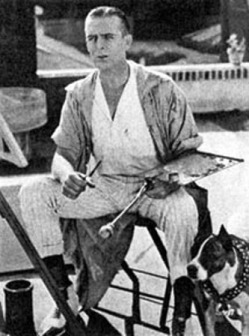 Wally portrays a young painter in "Rent Free". 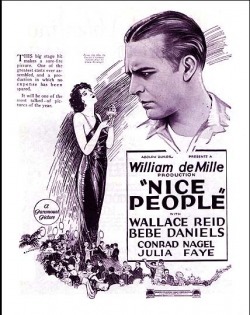 In real life, he really knew how to paint..
Movie poster for "Nice People".